An Atlanta native and graduate of The Lovett School, Kesha’s early professional pursuits led her to Southern Methodist University in Dallas, TX, where she earned a Bachelor of Business Administration degree with an emphasis in Management Information Sciences. When not exploring the ins and outs of finance, business administration, and entrepreneurship, Kesha devoted her time and talent as a member of Alpha Kappa Alpha Sorority, Inc., by lending her burgeoning event planning savvy to a number of her chapter’s key programs and activities. After graduation, Kesha returned to Atlanta and joined a Fortune 500 company, where she honed her skills in project management. The desire to launch her own business persisted. A survey of her close friends and family revealed that those who knew her best admired her ability to orchestrate events and take them to a higher level. The seed was planted, and Kesha set out to pursue event planning. 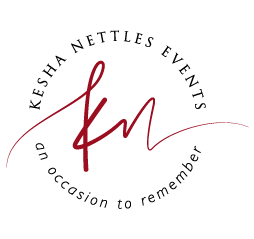 Officially launching Kesha Nettles Events on what would have been her Big Ma’s 100th birthday, Kesha stands out from others in her field due in large part to her exceptional attention to detail, and the timeless, classic energy her events provoke. With a decade of experience working at one of Atlanta’s premiere wedding planning companies prior to starting her own, Kesha developed a knack for streamlining her event planning strategy so that every project is flawlessly and seamlessly executed. Even the most Type A clients can relax knowing they are in good hands with KNE; her clients can truly be guests at their events, enjoying their momentous occasion without having to worry about any detail—great or small. Kesha thrives off of watching her clients experience the joy that comes from seeing their visions brought to life, and offers an assortment of services to perfectly suit each client’s unique needs. Kesha dedicates herself to manifesting her clients’ dreams and delivering the ultimate occasion to remember. A wife and mother of two, Kesha enjoys spending time with her family, reading, dancing and experiencing new adventures. With events that are bold and edgy; timeless yet modern and chic, sophisticated, and luxurious, it’s no wonder her favorite color is red—a hue that embodies all of these qualities.